- not including his work on The Eagle, or indeed his vast output on older British comics, chiefly TV Century 21 and Look-in. A rare slice of giant monster carnage from a master of all genres. It could be a panel from any given Future Shock. Burns makes it better than that. 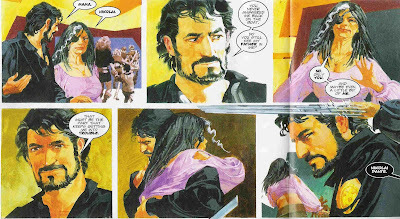 Classical painted comics. Scene-setting. A touch of gurning. A hint of retro sci-fi styling. Even a bit of the Carry-on, although that could be more do to with the inherent tone of Nikolai Dante than Burns’s art style. Burn's Dredd is pure Eastwood. Closed-mouthed at all times! John Burns is a stalwart British comics veteran who came to 2000 AD relatively late on in his career. I’d be curious to know if he was sought out by then-Tharg, or if he contacted the offices himself when work for other publishers began to dry up in the late 1980s. In any event, he was a proper professional with sufficient talent to only take on work that he wanted. And at first that meant working on Judge Dredd. And not just any old Dredd – mostly the more serious and indeed wider plot-driven arcs, from the final nail in the coffin of the Democracy storyline, to the return of Stan Lee, to Raider, one of Garth Ennis’s more moving and less silly pieces, to the very creation of the Public Surveillance Unit and major Dredd antagonist Jura Edgar. Karl Radier recalls his painful past. Part of the reason this worked out so well is that Burns seems to command a slightly old-fashioned tone that veers away from the Sci-Fi silliness that has made Dredd such a delight in many of the funny stories. Instead, Burns injected a noir feel – to be honest not a million miles from Bladerunner - with his MC1 feeling a lot more like a 20th Century city with the odd bit of future tech. 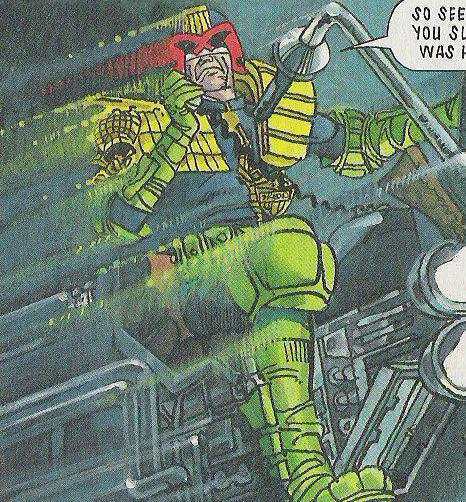 Dredd on bike with motion blur. Edgar on wheelchair with sinister thoughts. 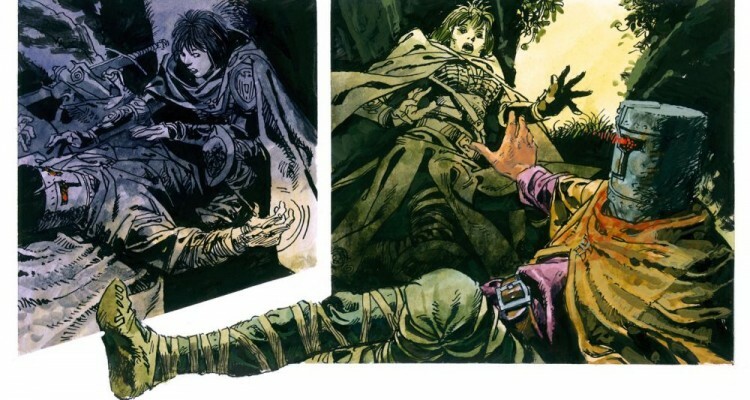 It suits the moodier, character-based stories he was commissioned to draw. Indeed, he’s one of those artists who makes all his characters feel lived in and vibrant in a kind of Dickensian way. Not always subtle, but always potent, and very useful when working on all-new series as he’s been doing recently. 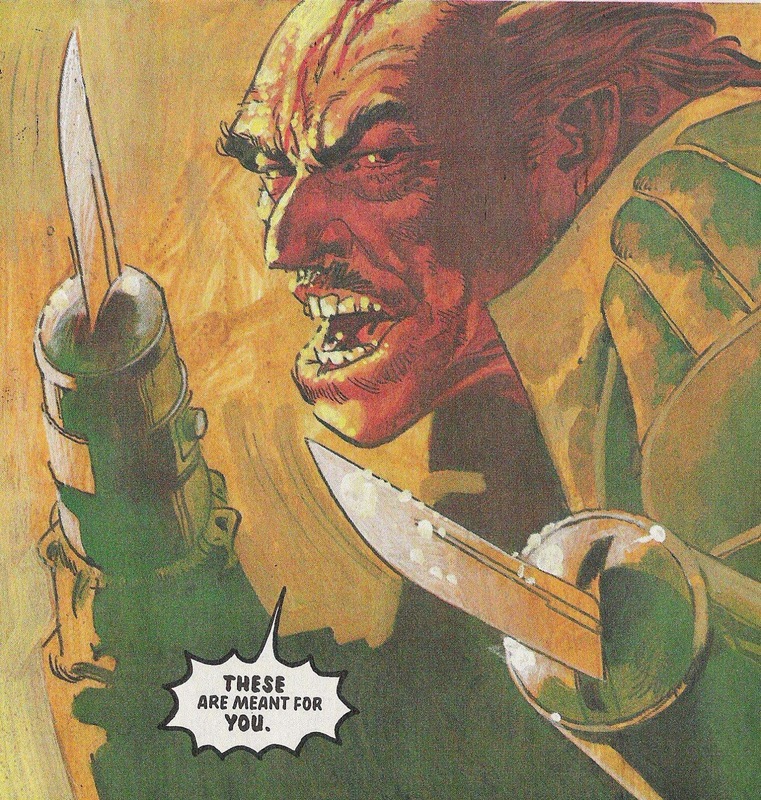 Villain with moustache and knife-hands. Not subtle, still potent. Outside of a couple of Vector 13s, and pseudo spin-off Black Light (which I’m still sad never got beyond it’s original run), Burns remained a Dredd-only artist; indeed as often as not a Wagner-only artist, until new thrill Nikolai Dante caught his eye. 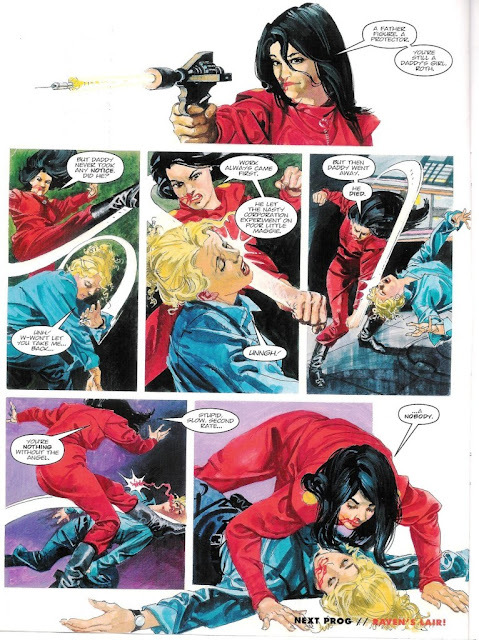 He soon got himself on the list of rotating artists on that series until he became the mainstay, taking turns with series co-creator Simon Fraser up until the end. Personally, my enjoyment of the early episodes of that strip were a lot to do with Simon Fraser (and I’ll go into that in more detail when it’s his turn! ), but it’s undeniable that Burns helped take the strip in a new direction, and may indeed have helped inspire Robbie Morrison to try out some different things, too. 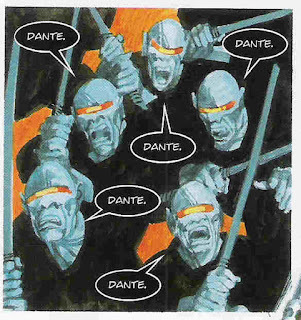 The story goes that Morrison had originally conceived of Dante as an alternate history story, rather than full on science fiction. Burns’s style certainly brings that home. His very first outing on Dante may have centred around futuristic pirate ships, but very soon he brought his classical touch to scenes of battle that would entirely suit a history of the Napoleonic Wars. Tsar Wars gets off to a sumptuous start. Meanwhile, a host of new fully human characters: Dante’s mother; his cohorts in the Rudinshtein Irregulars, began to take up more space, leaving less for the more fantastical aliens and cybernetically enhanced Romanovs. And, where Fraser brings a sense of anarchy and exaggerated emotion, Burns delivered much more straight-up comedy and tragedy. Along the way, Burns teamed up with Robbie Morrison again to dabble in a much more overtly 1970s style thriller, the Bendatti Vendetta. 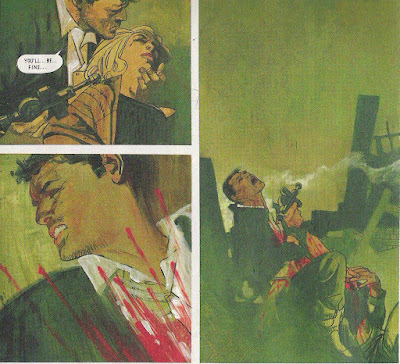 This was a brutal revenge strip that combined gangsters with jet-setting and expensive clothes. And a serious amount of red. Lots of room for Burns to combine dour faces with grimaces of pain and even cries of anguish. 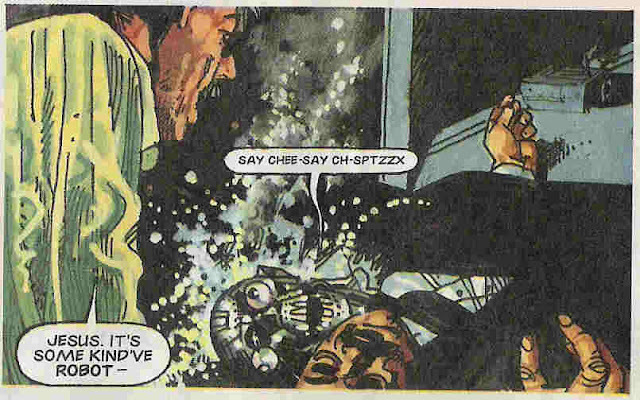 And, unlike almost any other 2000 AD series, it’s not at all funny. With Dante completed, Burns was finally free to tackle more Dredd, and, more recently, all-new stories. 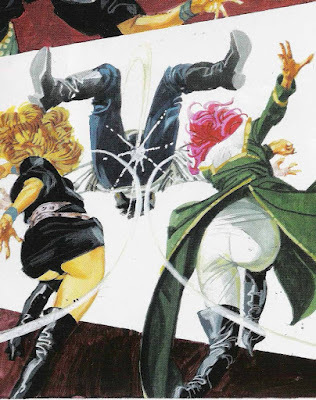 Working with veteran one-off wonder Kek-W, Burns leant his classical stylings to pulpy romp Angel Zero and phantasmagoric history tale The Order – a story that I can see returning for a second series one day. Angel Zero is some respects had a fairly straightforward plot, but my goodness did the art elevate the material. It’s a classic ‘heroine on a backwater planet with a happy marriage, who finds that she cannot escape her mysterious and violent past’. What Burns helped draw out was the emotion of the heroine and her husband’s plight, and then the impressively weird sci-fi mangling that is her violent past. The Order brings in a much larger range of characters: a young woman, a team of elderly knights, and the evil wirms. I’m especially fond of Ritterstahl, a robot who has the ghost-like ability to posses the living or even re-animate dead bodies and is ultimately a crusader knight’s head stuck onto a series of zombie bodies. One of the latest in a long, long list of supremely original and weird 2000 AD protagonists, chiefly memorable for his look. And once again, Burns’ love of period detail (this time, the 13th Century) brings the story to life in ways that another artist may not have. 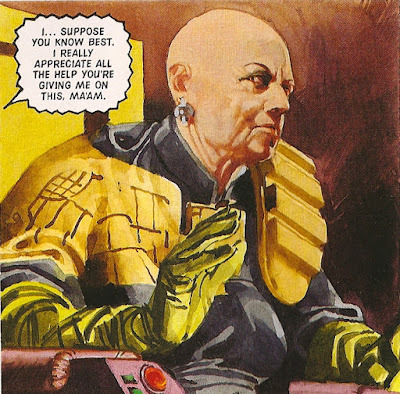 John Burns may not quite count as the old guard when it comes to 2000AD, but as one of Britihs comics longest serving artists, he’s a true talent to treasure. Nikolai Dante: basically all his episodes are fab, but I do especially love his gigantic splash page for ‘How could you believe me when I said I love you when you know I’ve been a liar all my life’? Up there with the best of Will Eisner, that one. Burns brings the comedy violence, 2000 AD style. 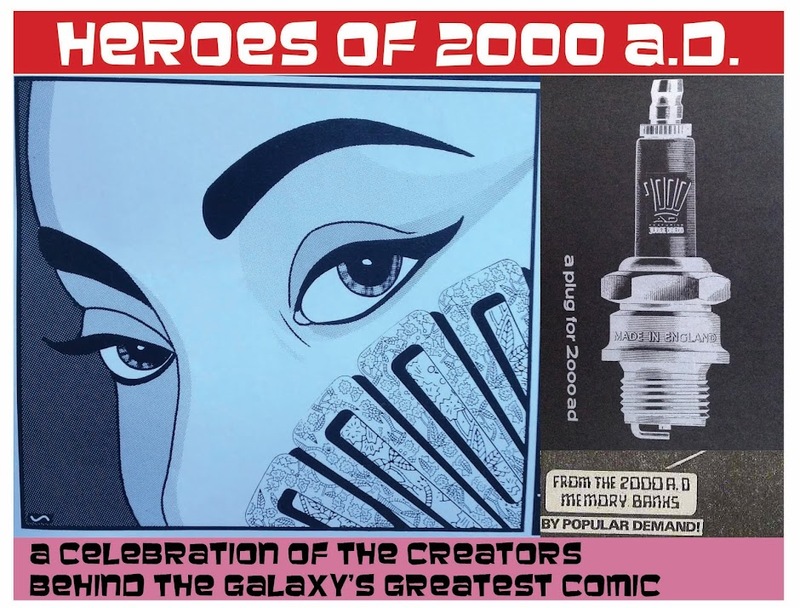 Occasional 2000 AD artist John Haward has a little tribute on his blog. *I think? Did they appear before the story ‘The Cal Files’? In any event, Burns’s rendering of Edgar in particular is pretty definitive. **My knowledge of British comics pre-1980 is negligible. I’ve heard of, but never read, the Trigan Empire, which lots of 2000 AD artists seem to bring up in interviews as inspirational, and sounds a bit Dante-esque in scope. This may or may not have been the norm! ***Burns only drew the first two episodes of this time travel tale in which Dredd finds himself in late 20th Century New York. Suits his style to a T. It's vastly underrated as a whole, if you ask me. I gather it was reworked by John Wagner from being a Terminator story into a Dredd story. 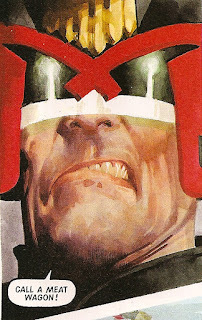 As a result, for the first 6 epsiodes or so, Dredd basically is a villainous Terminator, coming from the future to murder people one by one. Fascinating premise, slightly ruined by the explanation being made obvious too early on.